The recent conflict in the Peruvian Amazon is only the most violent symptom of an ongoing cold war being waged by President Alan García and his ruling Aprista party against indigenous groups. Besides a racist propaganda campaign and violent repression, the government has tried highly suspect legal mechanisms to disarticulate indigenous power. Government propaganda is aimed at pushing a free market economic development model with a strong focus on trade and natural resource exploitation. García has issued a series of decrees required by the U.S.-Peru free trade agreement (F.T.A.) to open the Amazon to exploration and exploitation of its natural resources. A recent study shows García's initiative projects to negotiate blocs covering up to 72 percent of Peru's Amazon with oil and gas companies. In the process, the García administration has placed its free market ideology on a collision course with collective indigenous land and natural resource rights, which are protected under international law. But the plan backfired amid the government's response to opposition and its brutal repression of indigenous protestors. A recent poll found that 92 percent of Peruvians support the indigenous cause against the Amazon decrees. The most despised of García's decrees were repealed. But the government has nonetheless continued a low-intensity conflict against Peru's indigenous groups. For García, a central tactic has involved trying to associate indigenous groups with Hugo Chávez and Evo Morales. In a recent statement, clearly alluding to his left-leaning rivals, García said, "Peru is living a cold war against foreign leaders." But even before the violence broke out in the Amazon, the real cold war was the one being waged by García against Peru's indigenous peoples. The battle in the Amazon was the violent culmination of months of government harassment and low-intensity conflict. Despite stirring up intense opposition, García seems intent on pushing forward with his unpopular agenda. Even prior to the formal implementation of the F.T.A. with the United States last February, García was already laying down the foundation for his cold war. In October 2007, he penned an opinion piece titled "El syndrome del perro del hortelano," or the syndrome of the barnyard dog, for the Lima-based daily El Comercio. The title compares those advocating the protection of the Amazon's resources to a barnyard dog growling over food that it does not eat but will not let others have. Besides insinuating a racist comparison between indigenous peoples and dogs, García blamed his opponents—singling out indigenous—for standing in the way of Peru's development via foreign capital. Since Peru's congress ratified the F.T.A., García has twice faced off against Amazon indigenous groups over the natural resources in their territories. On both occasions—in August 2008 and the recent uprising in June—García's decrees sparked large public protests principally led by the Association for the Development of the Peruvian Amazon (Aidesep), Peru's largest national organization of Amazonian indigenous communities. The President responded to both protests by suspending constitutional guarantees in the restive provinces and the mass deployment of security forces to the regions. García also made statements intended to frighten Peruvians who have only recently begun to recover from twenty years of political violence. He evoked images of dangerous armed insurgents in an attempt to paint indigenous protests as part of a larger plot to destabilize the country. He resorted to the language of Peru's brutal civil war in which 75,000 people lost their lives by absurdly blaming the protests on "international communism." A police general even blamed indigenous protestors for firing on a helicopter, an act that in reality occurred hundreds of miles away in an incident with drug-funded Shining Path guerrillas, according to Ideele Magazine. The deliberate confusion of the two events was a clear attempt to draw correlations between the indigenous protests and the armed group that terrorized Peru for so many years. The García administration made outlandish accusations that the main opposition party and the Bolivian and Venezuelan governments were behind the protests. And in an apparent attempt to weaken political opposition, one government-aligned leader of the Congressional Ethics Committee stated her intention to investigate whether sufficient evidence existed to take action against opposition legislators with ties to Alberto Pizango, Aidesep's President. The indigenous leader was recently forced to flee Peru after the government filed sedition and rebellion charges against him for the violence in Bagua, which was the epicenter of the most recent mobilizations. García has portrayed the protests as part of a communist plot initiated by Venezuela and Bolivia, but he has publicly admitted to having no evidence for the accusation. Prime Minister Yehude Simon, who has been a key figure of the government's propaganda campaign, echoed the baseless charges. (Amid public pressure, Simon has since been replaced.) For Simon, it was all part of a vast conspiracy in which Bolivia and Venezuela were trying to weaken Peru's hydrocarbons industry in an effort to boost their own. García has backed these accusations with actions. His administration recently launched an investigation into Aidesep by the Peruvian Agency for International Cooperation (A.P.C.I.). The president modified A.P.C.I. 's authority through a much-criticized 2006 statute that greatly enhanced governmental controls over the operations of non-governmental organizations (NGOs). This is the second time Aidesep is being investigated by the A.P.C.I. A.P.C.I. 's mandate includes monitoring NGO projects and activities to ensure that they are in line with the government's own development goals—in the case of the García administration, free trade and the exploitation of natural resources. As part of this process, the agency requires NGOs receiving international funding and certain state benefits to register with the agency. The law also introduced new enforcement measures that allowed the agency to fine NGOs and even revoke their legal status, barring them from receiving outside funds for non-compliance with A.C.P.I. registration and government development directives. In a September 2007 opinion, a Peruvian high court declared parts of the law unconstitutional, but many of the stipulations introduced by García remain. The timing of the investigations and statements made by A.P.C.I. officials indicate strong political motivations. The first A.P.C.I. investigation was launched in August 2008 during intense negotiations between indigenous protestors and the government. At that time, A.P.C.I. Executive Director Carlos Pando advised NGOs to abstain from involving themselves in social conflicts because it went against the nature of their work. He expressed concern about the influence that certain NGOs had over indigenous communities by providing them with false information that often led them to protest government actions. He also warned them that these activities could lead to the cancellation of NGO's legal status. By the end of August, however, Congress repealed the controversial decrees and the A.P.C.I. investigation concluded without result. The second investigation was announced in May in the middle of the 60-day standoff in the Amazon. Its announcement sparked widespread condemnation by human rights groups angered by its apparent arbitrariness. Critics of the move noted that A.P.C.I. was strictly barred from using its fiscal authority to threaten the daily workings of an NGO. They also asserted that the second A.P.C.I. investigation appeared to violate governmental assurances of objectivity made during an October 2008 thematic hearing on the subject held at the Inter-American Commission on Human Rights in Washington, D.C.
At the same time, the administration was trying to portray indigenous peoples as a threat to the country's national security, García again labeled indigenous protesters as simple people who failed to understand the true purpose of the decrees opening up the jungle for resource extraction. He asserted that, contrary to harming indigenous lands, the decrees were designed to actually protect the Amazon from coca producers, contamination from illegal mining and illegal logging. These assertions were repeated in proclamations published by Peruvian embassies abroad, likely in an attempt to quell the huge global recrimination of his government’s actions. The national Peruvian media, often accused of representing the interests of the politically and economically powerful, eagerly supported the racist stereotyping of indigenous people. Indigenous were routinely portrayed as uneducated or ill prepared and therefore not qualified to participate in any national debate over the future of their country. A particularly egregious example was a front-page photo of indigenous Congresswoman Hilaria Supa, a representative from Cuzco, that appeared in the Peruvian daily El Correo. The photo, published in the middle of the spring protests, shows a close-up of her handwritten notes that were obviously presented to ridicule the native Quechua-speaking congresswoman for her Spanish writing abilities. The accompanying articles insinuated that Congresswoman Supa’s limited Spanish skills were evidence of her lack of preparation for high office, something she only achieved, said the newspaper, because of racial politics. The articles attacking Supa's credibility did not stop there. They also referenced her previous stands against the García administration's aggressive free trade policies as examples of her "poor" work as a congresswoman. García echoed these same sentiments when he referred to indigenous protesters as "second-class citizens" who dared to block Peru's progress. Despite all his efforts, García appears to have lost yet another battle in this long cold war against indigenous groups. Once again, the Peruvian Congress has decided to repeal the controversial Amazon decrees—an action García now states he supports in the name of national unity. But the cold war continues and could possibly intensify into open battle, as happened the last time the government provoked the indigenous to protest. In late June, a congressional committee approved a bill that amends the A.P.C.I. statute to again allow for broad governmental regulation of NGOs. The new bill allows for the agency to regulate funding from private foreign sources. The law also expressly prohibits NGOs from making any kind of statement that could incite violence—an incredibly broad standard that could be used to criminalize NGOs as well as impose limits on their right to the freedom of expression and association. Rolando Souza, a congressional ally of disgraced and jailed former President Alberto Fujimori, used the Bagua violence as an example of why the government should monitor the foreign financing of local groups. Congressman Souza singled out Aidesep as the principle reason for the legislative action. Still, those making such arguments have not presented a shred of evidence to support the claim of any foreign involvement. Meanwhile, a June poll found that García's approval rating has sunk to a meager 21 percent. 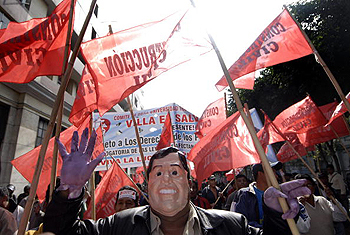 Broad sections of Peruvian society continue to take to the streets in protest of the García administration's policies. In Cuzco, campesinos recently declared a general strike to protest the granting of mining concessions totaling 70 percent of their province. Protestors were also demanding the enactment of a new Water Resources Law that declares water a national resource with its usage regulated by the state. Again, the government sent in troops to remove the protestors, resulting in the death of a campesino. The government also continues to face the repercussions of the events that occurred in Bagua. On July 10, the Peruvian Ombusdman's Office announced its investigation into the disappearance of Lewis Wassum, a member of an Amazon indigenous community. Wassum was last seen in a photograph published June 8 that showed him being led into a police station in handcuffs. The government and indigenous leaders have also agreed to initiate an investigation into the events in Bagua. The question remains as to whether or not García will continue his cold war against the country's indigenous peoples. But one thing seems certain: His administration has refused to back down on its goal of extracting resources from the Amazon, whatever the consequences. Less than two weeks after the Bagua violence, which some rights groups have called the Amazon's Tiananmen, the government gave a green light to a French oil company to begin drilling for oil in an area of the Amazon inhabited by indigenous groups who were not notified. Stephen Corry, the director of Survival International, which advocates indigenous rights worldwide, said, "Anyone who hoped that the dreadful violence of the past few weeks might have made Peru's government act with a bit more sensitivity towards the indigenous people of the Amazon will be really dismayed at this news." Corry continued, "The timing couldn't be worse; the government is trying to present a more friendly image in public, but as far as the oil companies are concerned, it looks like business as usual." Kristina Aiello is an N.A.C.L.A. Research Associate and a human rights advocate. This article was originally published on NACLA.org (https://nacla.org/node/5995).